This Q&A is based on an interview from The Nice Guys on Business Podcast. 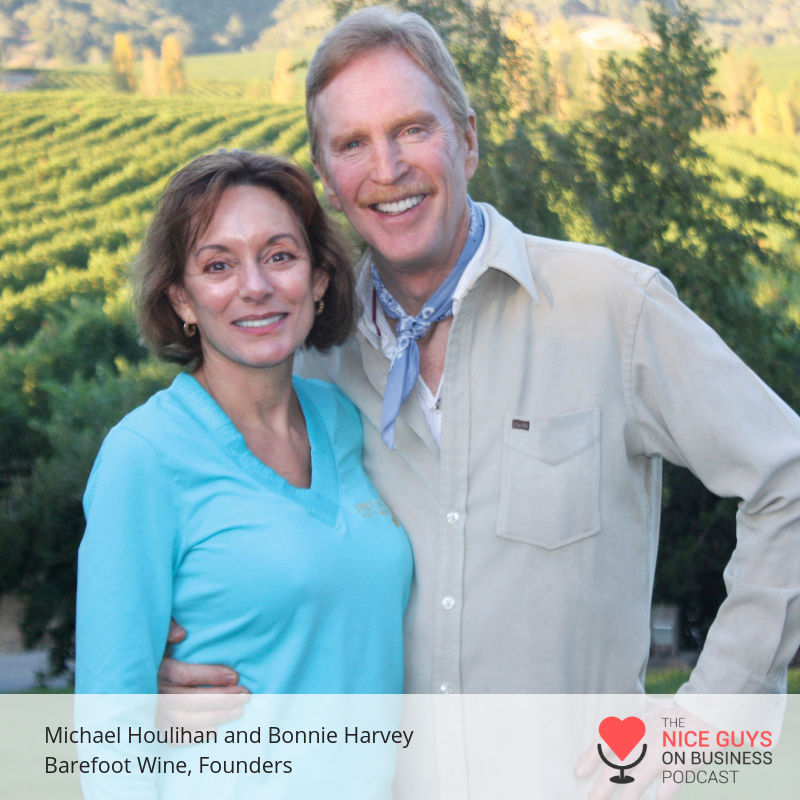 Michael Houlihan and Bonnie Harvey—co-founders of the iconic Barefoot Wine, which was acquired by E&J Gallo in 2005—came on the podcast to share some of their secrets for building a successful brand. Pioneers of cause marketing, Michael and Bonnie drove sales for Barefoot by donating wine to nonprofits instead of spending money on advertising. “We showed empathy for their causes and engaged our clients,” Michael says. The business duo actively share these kind of insights from their entrepreneurial journey. They are co-authors of The New York Times bestseller The Barefoot Spirit and travel the world leading workshops, trainings, and keynoting at business schools, corporations, conferences. Their newest book is The Entrepreneurial Culture: 23 Ways To Engage and Empower Your People. Are you a winemaker-turned-businessperson or businessperson-turned-winemaker? Bonnie: We were never real wine fans. One of my clients was owed a debt of $300,000 by a winery for its grapes. The winery was unable to pay so I sent Michael over to collect the funds. As it turns out, all he could collect was $300,000 worth of bottling services and bulk wine. After six months of research, we looked at each other and said; "I guess we're in the wine business now." Michael: I remember coming up the driveway to the winery and the guard says, "We declared bankruptcy this morning. I hope you're not here to collect anything." So when I got up there, I looked through the window and saw all these tanks that were filled with bulk wine. And I also saw their bottling line that processes 3,000 cases per day. And then it hit me. I told them to bottle some of the bulk wine and pay me in bottled wine instead of money, since they didn’t have any money. And that's how Barefoot got started. How long did it take before you knew that this business was more than just a way to pay off a debt? Bonnie: It was extremely difficult to come up with a label and get it on the market. Once we started getting feedback from our customers, we were convinced to keep going. The truth is that the retail buyers and distributors were all men and they ignored the fact that the average woman was buying a bottle of wine with her weekly groceries. They didn't see them as a customer and we saw it as an opportunity that hadn't been addressed. How much time did you spend on the label design versus the wine that actually went into the bottle? Bonnie: We have a top-notch winemaker who helped us with our blends, so we didn't need to worry about that. But, satisfying the needs of the marketplace was a big part of our concern. Michael: Even though we had identified a market and had a good product-market fit, we had to overcome the hurdle that many entrepreneurs face: thinking that our product was so good it would sell itself. It's 80 percent marketing—so we spoke to all the people who handled the labels, the bottling machines, and the trucks because we knew these people could provide insight that others couldn't. They knew that it didn't matter if a label was cute. It only mattered if it could be read from the other side of a warehouse or how it worked with the lighting in the supermarket. They taught us how to get our bottle noticed even if was hidden away on a store shelf. Do you think corporate culture is important to an organization’s success? Bonnie: Absolutely. We realized early on that one way to retain good people was to understand the difference between know the need and need to know. We provide transparency to all employees and they have fantastic insights. We had a problem in Florida where we were placed on the bottom shelf of a huge chain store and they told us if we didn't sell enough cases, they'd discontinue us. So one of our employees had the brilliant idea to leverage our Barefoot name and place a purple foot decal on the floor leading customers from the entrance of the store to our product. And it worked! We took it national and it was popular with every store we tried it in. And the best part of this story is that the idea came from the receptionist, Mary. Michael: This created a truly collaborative corporate culture. We sent a memo out to the company thanking Mary for her great idea. And so Mary saw that if she comes up with other great ideas, she'll be appreciated and other employees realized the same. The idea is that top management was telegraphing to everyone in the organization that it was okay to have crazy ideas and come up with solutions to real problems even if they weren't "qualified." So how do you figure all this out if you're a solo entrepreneur and don’t have all that manpower? Michael: You just need to listen to everything going on around you—especially colleagues, competition and conferences. If you're a solo entrepreneur, the best thing you can do is go to people who have already purchased from you and ask what you could’ve done better. See what you did right and where you could've improved. You need to utilize and leverage off your colleagues, competitors and clients. They’re your best resources. Bonnie: And as you’re growing, it really helps to keep a goal book to mark your accomplishments. We often go back to our goal book that we've been keeping for about 30 years and we look at the progress we've made. What’s really rewarding is when we have a major goal to check off—like selling our company. The goal book really helps you to see every problem as a learning experience from which to grow. Michael: We always tell young entrepreneurs that what really keeps us going is validation. So with this goal book, every time you achieve some aspect of your goal, you write it down and put the date you achieved it. And when you're frustrated, you can reread those achievements and realize how far you've come. The book has divisions in it—for wealth, health and your staff. And there are also divisions for your home and your spiritual outlets. Here I don’t mean religion; I mean keeping your eyes open for new opportunities and recognizing when timing is really in your favor. How do you determine your next step if you're not experiencing success? Bonnie: We're very fortunate that we have each other to depend on. The unspoken rule is that we can't both be down at the same time. So we're very good at encouraging each other. I think if you're a solo entrepreneur, it really helps to have someone—a business partner, significant other or family member—to encourage you when you’re feeling down. Michael: Exactly, and this is really the time to call up your early adopters and have them reassure you as to why they thought your idea was so great. When you show that kind of vulnerability, you often get the support you want. If you're by yourself and you're feeling depressed, just take a walk. You'd be surprised at how much it helps to get your eyes off the screen and get a little fresh air. Bonnie: Another thing you can do is just sleep on it and rely on your wonderful brain to solve the problem while you sleep. What are some unexpected gifts you got through building your business that you didn't anticipate when you got started? Bonnie: Very early on, we realized the value of worthy cause marketing. We had no money for advertising so we had to figure out how to get customers to buy our product. We got a call asking for a donation for a children’s park in San Francisco. We explained that we don't have any money but we have wine, so we gave them some of that to sell or serve at a party to help loosen people up to write bigger checks. And what we didn’t anticipate was that stores in that neighborhood were reordering our wine. So we donated to another fundraiser in a different neighborhood and we got reorders there, too. By supporting these nonprofits, they become advocates for our product. As we went along, we learned how to ask for things that didn't cost the nonprofit any money—like being featured on their website or through word-of-mouth. Michael: We were giving the members of the nonprofit organization a social reason to buy our product. This is stronger than any mercantile value as they're buying your product because you support their causes. We showed empathy for their causes and engaged our clients.